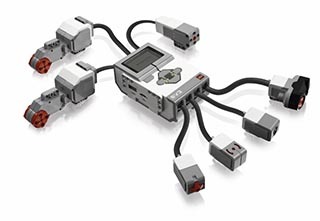 LEGO Education MINDSTORMS EV3 is the third generation of LEGO's Robotics products. Starting with RCX, then moving onto NXT, LEGO's EV3 system represents the cutting, creative edge of educational robotics systems. The EV3 system is an excellent Science, Technology, Engineering and Mathematics (STEM) teaching tool, for use both within the school day or as an extra-curricular activity, as it engages students and gives them the tools to understand through hands-on experience and creative and logical Design-Make-and-Test solutions to a problem. It also provides an entrance path to the World Robot Olympiad (WRO) competition as well as the FIRST LEGO LEAGUE (FLL) Competition, where the most creative Robotics students compete in teams against other countries.